Residents of central Somalia said Thursday that hundreds of Ethiopian troops were patrolling the town of Baidoa in armored vehicles, less than a day after Islamic militants moved near the base of the weak, U.N.-backed government. An Ethiopian government spokesman had said his country would protect Somalia's transitional government from attack by Islamic militias. Numerous witnesses told The Associated Press that Ethiopian soldiers arrived Thursday afternoon in Baidoa, 150 miles northwest of Mogadishu. 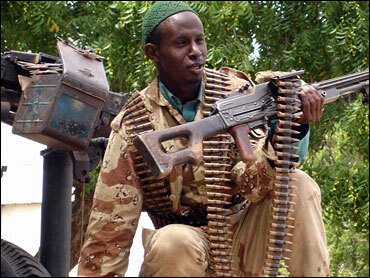 The Ethiopian troops have set up a camp near the transitional president's home in Baidoa, residents said. "People were prevented from walking on the road that leads to the building," one resident said on condition of anonymity because of fears of reprisals. Ethiopian and government officials were not immediately available for comment. But Ethiopian Minister of Information Berhan Hailu told the AP on Wednesday that his government would intervene to prop up Somalia's transitional government, which has no effective military of its own and only controls Baidoa. "We have the responsibility to defend the border and the Somali government. We will crush them," Berhan said. The Supreme Islamic Courts Council militia seized Mogadishu last month and installed strict religious courts, sparking fears it was a Taliban-style regime. The United States has accused the militia of links to al Qaeda that include sheltering suspects in the deadly 1998 bombings of U.S. embassies in Kenya and Tanzania. The advance on Baidoa, the seat of the transitional government, had prompted the government to go on high alert and neighboring Ethiopia to declare it was prepared to invade Somalia to defend the government. The U.S. State Department said it was "gravely concerned" by Wednesday's developments. Earlier Thursday, a senior council member said militiamen that had moved near Baidoa would pull back. Abdirahman Janaqaw, deputy chairman of the executive council, said it was not immediately clear if the withdrawal had begun. Somalia invaded Ethiopia in 1978 in an attempt to grab land occupied by ethnic Somalis. Since then, Ethiopia has attempted to influence Somali politics to prevent another invasion. Ethiopia sent in troops in 1993 and 1996 to crush Islamic militants attempting to establish a religious government. Somali President Abdullahi Yusuf Ahmed is allied with Ethiopia and has asked for its support. Hundreds of Ethiopian troops have been spotted along the countries' border in recent weeks — movements that the Islamic militia repeatedly has denounced.